Well I'm almost finished work on a gaming supplement that's taken me years to write and edit. Its all done and packaged except for the cover art. I'm posting several pictures that I'm looking at using for the cover art here and I'd love it you would let me know which one(s) you think are best. But first, what is the Jolrhos Field Guide? Well its a gaming supplement that is part of a series of books meant to provide a full campaign setting for role playing games. What that means is that its a book with information in it about a fantasy world, a setting for people to run games in. 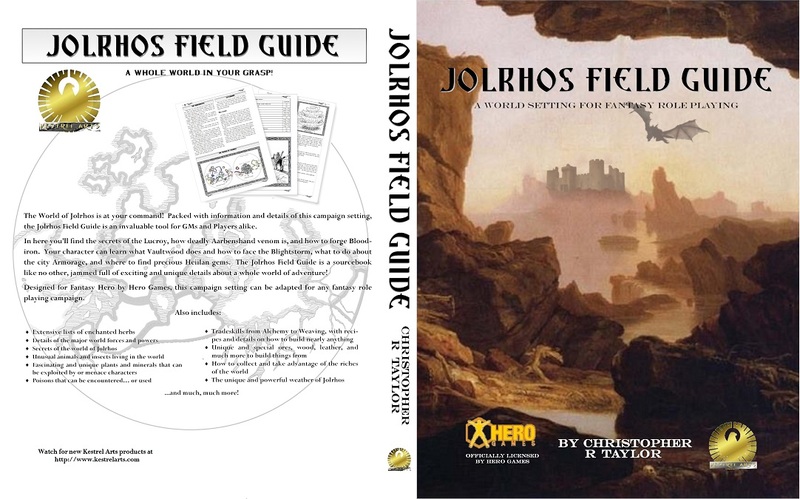 For more information on what this book is about you can check the page I created for it on my website, but in brief this is a world setting with geography, economics, politics, and info on cultures and races, but also tons of details about the world other than "things to kill and loot" which most game books focus on. For example, it has strange and unique creatures that live in the world which can be taken advantage of by players such as a porcupine like creature which keeps predators at bay, or a moss that has peppery dust on it which is released when disturbed. And the book also has magical herbs, poisons, amazing plants, and the tradeskills which can take advantage of all this such as alchemy, engineering, leatherworking and much more. 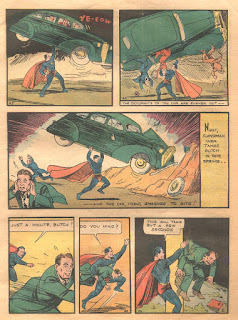 I got a copy of Superman Archives 1 from the library and read it. 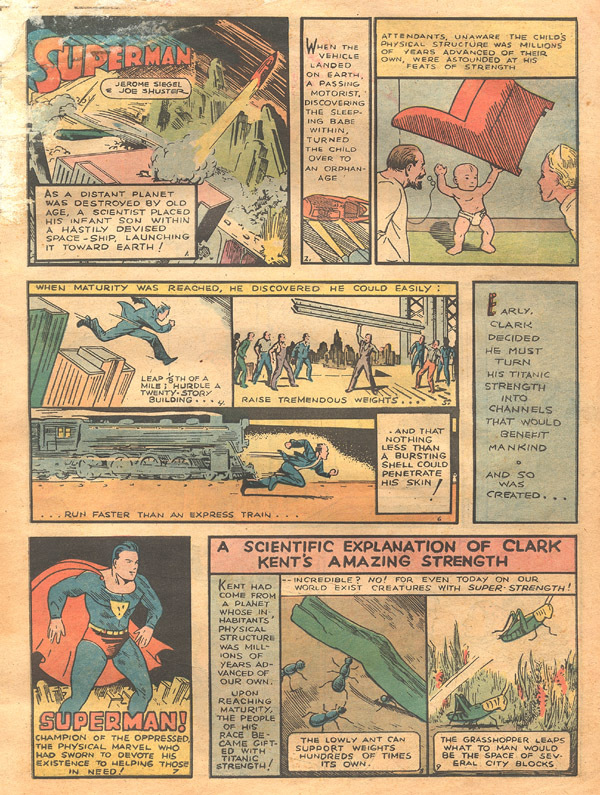 These are the very earliest Superman tales, his first appearances and some key early issues. 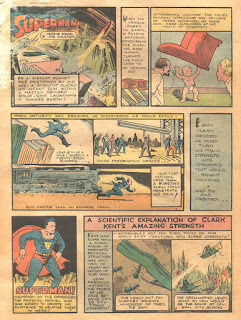 Action Comics 1-2 is in it, as well as the first appearance of Lex Luthor among several other early comics. Its interesting stuff for a lot of reasons. This is very early in the Superhero game; there were some costumed adventurers and crime fighters around such as The Shadow, but this was the first real superhero comic book and it borrowed heavily from an earlier novel called Gladiator by Philip Wylie. As most people know, Superman didn't have flight at first. Most of his powers were granted him in the silver age (super-ventriloquism, etc). At first he could just jump an eighth of a mile (660 feet, or 2 football fields) and over a 20 story building. He wasn't completely invulnerable either, a "bursting shell" could harm him. In fact his origin story is a bit different as well. The Kents find the boy and turn him over to an orphanage, then decide they love him too much and take him back. The Orphanage is glad to be rid of this child who can juggle cars. Nothing more is said of the child or his oddness by anyone. In fact, Superman is so blatant in use of his powers that just about anyone could figure out Clark Kent is Superman. In one issue, Clark Kent takes over for a football player he somewhat resembles and plays a few games for him, showing off his powers without any restraint. In another he does the same for a boxer, one-shotting enemies and ignoring punches. Some of Superman's behavior is a bit shocking as well. In issue 2 he goes to stop a war in some fictitious nation and eventually catches one of the generals. He just picks the guy up and hurls him "like a javelin" with all his strength over the trees. In another he grabs someone out of a crashing plane and interrogates him, leaving everyone else in the plane to simply die. In third instance a techno-villain hits him with lethal electricity, which he ignores, then grabs the guy frying him to death. Superman casually ignores people's deaths around him, if they're bad guys. Too bad for them their criminal base sunk to bottom of the ocean when I busted out. He even kidnaps the football star and drugs him, paralyzing him so he can take his place. Why do this? Well he overheard some thugs talking about bringing in a ringer so they can fix the games and throw them for gambling. Another change is that Superman starts in... Cleveland, Ohio. He works for the Star for a while, and only when Superman gets his own comic does he end up at the Daily Planet, in Metropolis. Lois Lane is there from the beginning, and she despises Clark Kent right away. She is pretty cut throat, too, even trying to drug Kent to get a story. She pulls nasty tricks on him several times trying to scoop Kent, which makes his attraction to her somewhat mystifying. Superman's ethics are pretty heavily defined by the author, Jerry Siegel. He's extremely anti-war and isolationist, pro-union (even protecting unions from mob influence and takeover in one episode). He fights against a corrupt coal mine boss in a curious issue where he is almost never in costume and only uses his powers a couple of times, letting the story unfold on its own. Superman's costume varies several times, even in the same issue sometimes. His belt appears and disappears, his boots change, the shield on his cloak shows up and goes away. He's barely in costume in several stories. Back then people weren't quite as picky about that kinda stuff. They just wanted fun adventures and frankly it was mostly little kids reading them anyway and they aren't as fixated on little details and nit picking. Oh, and this climactic image, so famous, that's on the cover of Action Comics 1? Lois Lane is inside the car. She's been kidnapped and Superman just bashes the car around with her in it bouncing around like popcorn (no seat belts back then kiddos). She's unharmed of course, but that definitely wouldn't be the approach these days. In a way its kind of fun to read them and imagine this being early Superman kinda learning the ropes. He had to figure out how to best use his powers, they're still developing (by the Lex Luthor issues, he's able to jump to the edge of space!). He doesn't always use the smartest tactics, preferring to brute force his way around and intimidate people. And boy does he. Clark gets sent to a wife beating story, Superman kicks the door in and slaps around the guy like a punching bag. Mobsters don't want to talk, so he throws them in the air then crushes a gun in his bare hands and threatens to do the same to their head. It really feels like geek wish fulfillment: here's what I'd do if I could juggle tanks. Overall its an interesting experience to read the old comics, particularly from a fan's point of view and someone who plays role playing games like Champions where you are a superhero. Superman has long been thought of as the iconic good guy who knows what to do and always does right, but these old comics, he really pushes the gray areas a lot. Its worth looking the comics over, because they're not only an interesting historical exposure to comics (the last panel of several of them is stuff like "Coming soon: BATMAN" first appearance stuff) but of the times and attitudes then. Oh, and yes, Lex Luthor has red hair in his first appearances. I haven't been doing very well lately because of so many things over the holidays and a busy month so I haven't posted for a while. As I am still not quite up to a full production, instead I'll do some quick reactions and thoughts on various current events. Abortion Laws: New York passed and several other states are rushing to get passed very broad, extreme abortion laws. European laws aren't even this broad. My guess is they see Justice Ginsberg on her last legs and are trying to get state laws locked in early before she dies and is replaced. They fear the overturning of Casey and Roe v Wade which would turn abortion decisions over to the states. Its depressing and upsetting to me that the radical and outrageous pro-abortion stance of Virginia governor Newsome (killing babies after birth) is being overshadowed by some stupid picture he may have of him in blackface, or a klan costume. 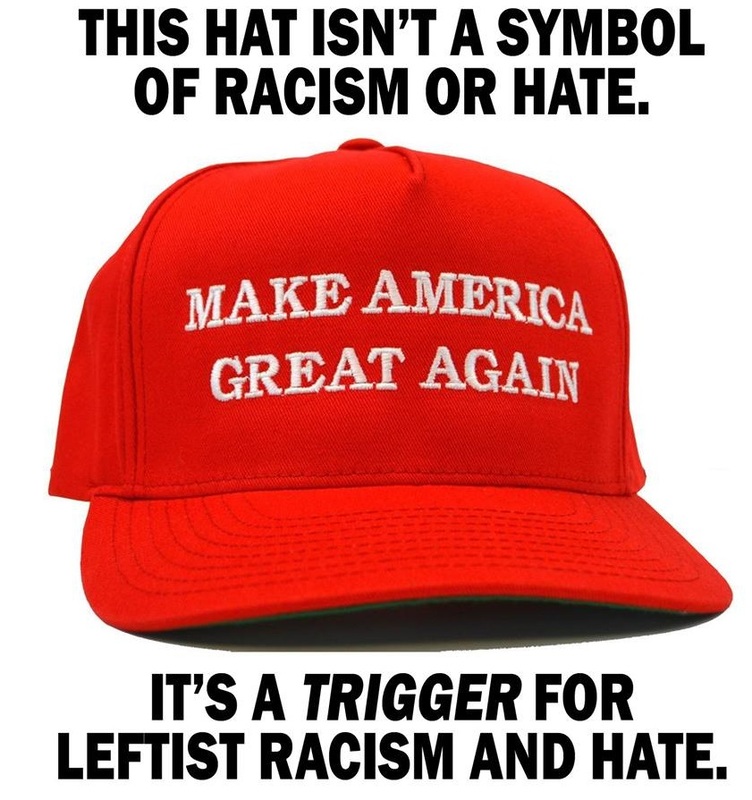 Racism is mean and stupid, but killing babies is evil. Meanwhile his lieutenant governor is accused of sexual misconduct against a woman years ago. While I wouldn't be surprised if he'd done it (everyone in power seems to be scum) I don't like the idea of just siding with a woman's word without evidence or support, and without her even saying anything at the time. Reporters being laid off at various news and quasi-news organizations, I sympathize with their sudden lack of work, as that's not easy to face. But at the same time, these news magazines and sites were running in the red and couldn't keep doing it forever. Plus a lot of them were ridiculously bloated, with literally thousands of employees, and that's way too many for what they do. And with sites like Buzzfeed the content is so awful they shouldn't have been kept on anyway. 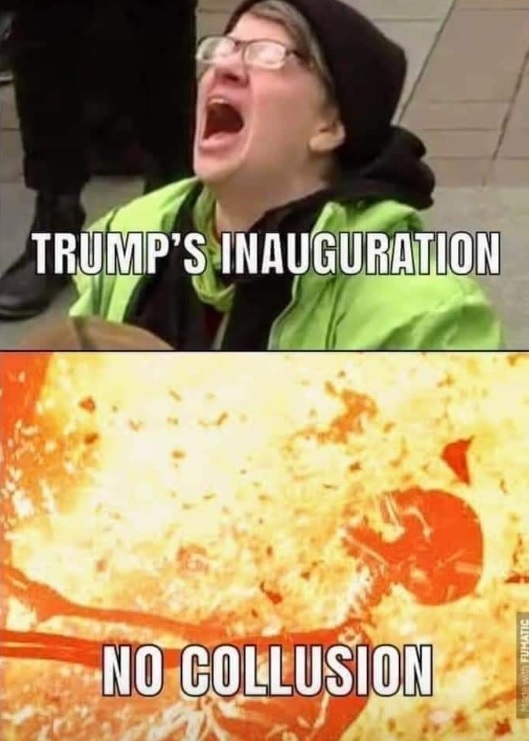 But I do wonder why January was such a festival of firing? Somehow I suspect these layoffs are related to the end of "Net Neutrality" and funding they were getting. But perhaps this is also related; $216 million funding ending December 2018 for "combatting misinformation in the media." Related to the layoffs is the "learn to code" jibe many were giving these fired people. Why say that? Because that was Joe Biden's crack against coal workers who lost their jobs under Obama's policies, and the press thought that was just clever and wonderful. 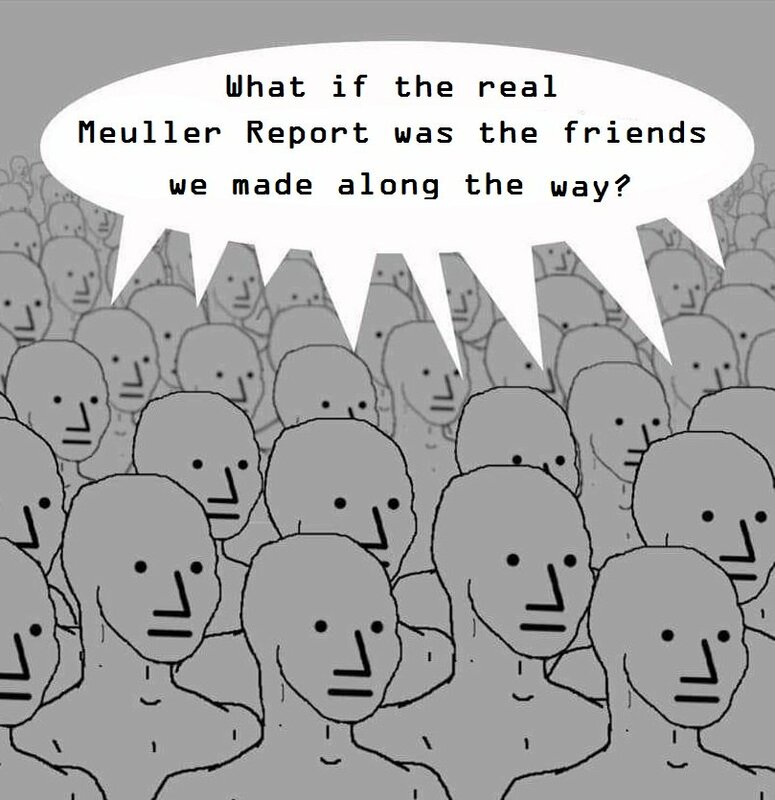 But Twitter (and the press) think the "learn to code" thing was some organized 4chan joint, all coordinated as a "targeted attack" which is utterly laughable. Yet when your entire world is top-down coordinated false grass roots, I guess that's all you see when something happens. So Twitter banned and shuts down any comments that mention the phrase. Jobs report looks great, that's a lot of new jobs and its more than required for bare maintenance of the workforce. The chart looks terrific over the last two years, and I expect more of the same for a while longer. Labor participation rates aren't great though, still fairly stagnant. 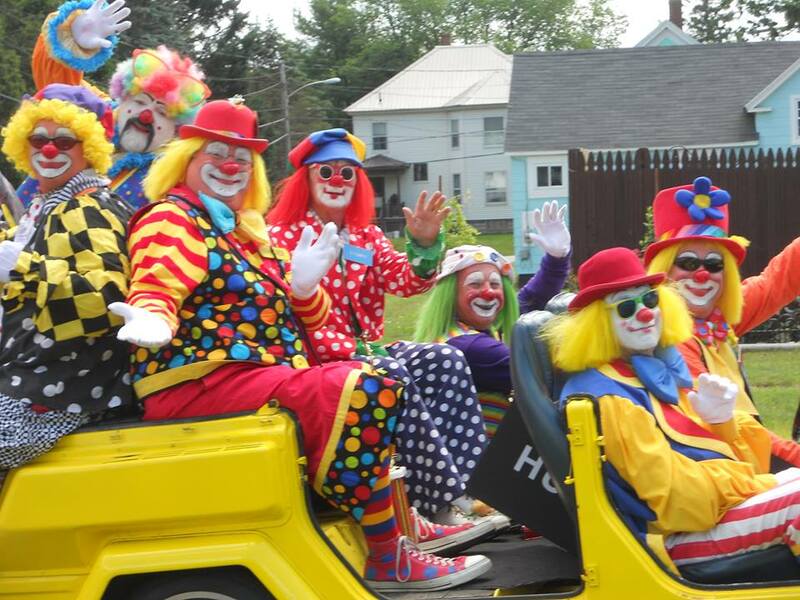 The Covington kids thing fell right on the heels of the Buzzfeed failed story that Meuller himself detonated. The press was so eager for the Buzzfeed story of Trump ordering his lawyer to lie for him ("if true...") they looked like idiots when it was demolished. I suspect that they were desperate for a story that helped turn the narrative and made the people mocking them shut up, and went way overboard. It was too perfect: MAGA hats, pro-choice rally, minorities vs white boys, they couldn't resist. 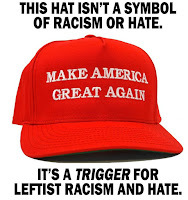 Jussie Smolett claims he was attacked by MAGA hat guys yelling "MAGA country" which struck pretty much everyone as silly. He was eating a sandwich and talking to his manager in -20 degree winter outside when guys with a noose ran up an accosted him? Every single aspect of his story falls to pieces upon closer examination. Just a ridiculous myth. 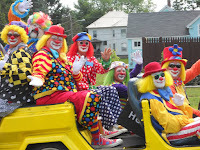 The Democrat clown car of would-be presidential candidates is filling up fast, but one wonders how many actually are running for president and how many just want to be considered for the VP slot. 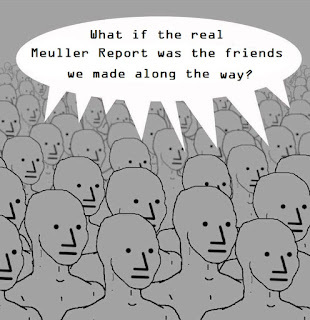 It was clear all along that every single leftist out there was going to file and join the race, but its pretty silly looking already. In Birmingham, England, muslim moms are angry at and protesting the aggressive pro-homosexual agenda in grammar schools there. This was a matter of time, and its probably happening a lot without being reported on because its so damaging to the narrative. Muslims are not pro-homosexual, and they are not shy about it. Gilette's daffy "our customers are brutish thugs and need to change" ad went over like a lead balloon. One wonders just how this kind of stuff gets past corporate bosses. Of particular interest was the racial politics: the black guys were almost universally heroic and telling the evil white men to stop being so cretinous and masculine. And finally the "Shutdown" which was pretty much all theater. It did affect some people, but not very many and the large majority of Americans had to be actually told anything bad was happening, since it had no effect on them whatsoever. The local news actually begged people to tell them stories of how the shutdown was hurting them, since they were apparently unable to find any and nobody was noticing. The problem is Nancy and Chuck were up against a wall: they couldn't back down after their rhetoric and their already barely contained control over an increasingly factured and radicalized party. They had nowhere to go. So now we see what happens next, if Trump will cave a third time on this or not.